So apparently it’s not fall after all. One of our irises has popped out in bloom. Should I be concerned? I know the climate’s changing, but this seems a little off. 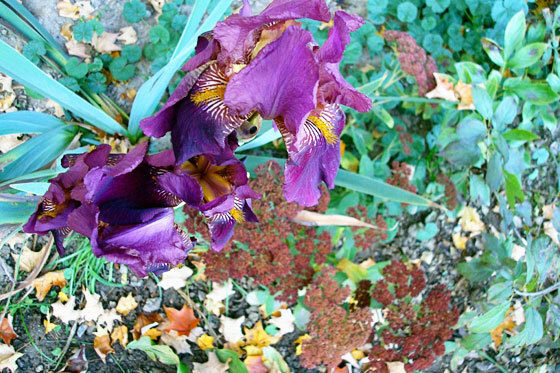 This iris bloomed already this year back in the spring. Isn’t that normal? 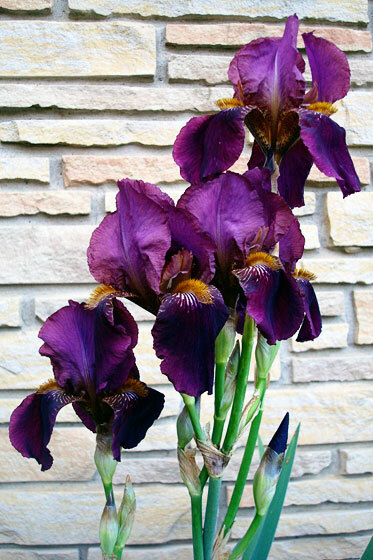 Aren’t irises usually spring flowers? At the base of the iris, the blooming sedum and fallen leaves give away what season it really is. Tell me. How weird is this? Have you ever had a flower bloom out of season? It’s pretty! 😀 Sharon says that they don’t know to go to sleep until it freezes. The ones by her work are also growing, though not have a second blooming yet. So it’s just a keener, then. Good to know I’m not the only one with a mutant plant. The frost was so thick this morning that I’m sure it’s regretting its mistake. How strange! I haven’t seen any irises down here but I did see some purple cone flower that look fresh like they just bloomed where usually this time of year they are all bug-eaten and brown and just ugly! I do have to admit that it’s nice to see the iris. Everything is so scraggly and brown at this time of year. The purple’s a nice change. Wow. Lovely. We’ve had strange occurrences on City Island this fall: snow-birds like black-capped chickadees and juncos appearing, which we think presage a very stormy and cold winter – but in October? And, yet, migrating warblers, a full month later than usual, flitting around our back garden at the same time! It’s a weird mix this year and this time of year. In terms of what it presages, I saw this post a few weeks ago about caterpillars: http://littlecityfarm.blogspot.ca/2014/10/natures-folk-wisdom-mild-winter-to-come.html. On the weekend, I saw two caterpillars that were almost completely orange (very small black stripes). According to this post, the wider the reddish-brown middle band, the milder the winter. Thanks for the link! We saw one of those caterpillars the other day at the NY Botanical Garden that also had an extremely wide orange band. Hmmm.